Illustrations: Lanark Cotton Mills, The Falls of Cora Linn. 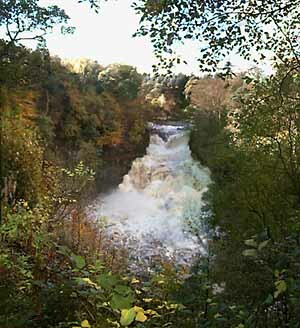 For centuries visitors have marvelled at these falls which cascade through wood gorges near the cotton mills of New Lanark. The following is an extract from the diary of Dorothy Wordsworth, and account of her Tour of Scotland of 1803 in the company of her brother William and the poet Samuel Taylor Coleridge. We turned down a steep hill, and came in view of a long range of cotton mills, the largest and loftiest I had ever seen. The girl left me at the porter's lodge. I had a delicious walk alone through the wood; the sound of the water was very solemn, and even the cotton mills in the fading light of evening had somewhat of the majesty and stillness of the natural objects. It was nearly dark when I reached the inn. I found Coleridge sitting by a good fire, which always makes an inn room look comfortable. In a few minutes William arrived; he had heard of me at the gate, and followed as quickly as he could, shouting after me. He was pale and exceedingly tired. After he had left us he had taken a wrong road, and while looking about to set himself right had met with a barefooted boy, who said ho would go with him. The little fellow carried him by a wild path to the upper of the Falls, the Boninton Linn, and coming down unexpectedly upon it, he was exceedingly affected by the solemn grandeur of the place.......the river, down which you look through a long vista of steep and ruin-like rocks, the roaring of the waterfall, and the solemn evening lights, must have been most impressive. The morning was very hot, a morning to tempt us to linger by the water-side. We left our inn immediately after breakfast. The waterfall Cora Linn is composed of two falls, with a sloping space, which appears to be about twenty yards between, but is much more. The basin which receives the fall is enclosed by noble rocks, with trees, chiefly hazels, birch, and ash growing out of their sides whenever there is any hold for them; and a magnificent resting-place it is for such a river; I think more grand than the Falls themselves. After having stayed some time, we returned by the same footpath into the main carriage-road, and soon came upon what William calls an ell-wide gravel walk, from which we had different views of the Linn. We sat upon a bench, placed for the sake of one of these views, whence we looked down upon the waterfall, and over the open country, and saw a ruined tower, called Wallace's Tower, which stands at a very little distance from the fall, and is an interesting object. A lady and gentleman, more expeditious tourists than ourselves, came to the spot; they left us at the seat, and we found them again at another station above the Falls. Coleridge, who is always good-natured enough to enter into conversation with anybody whom he meets in his way, began to talk with the gentleman, who observed that it was a majestic waterfall. Coleridge was delighted with the accuracy of the epithet, particularly as he had been settling in his own mind the precise meaning of the words grand, majestic, sublime, etc., and had discussed the subject with William at some length the day before. "Yes, sir," says Coleridge, "it is a majestic waterfall." "Sublime and beautiful," replied his friend. Poor Coleridge could make no answer, and, not very desirous to continue the conversation, came to us and related the story, laughing heartily. Extract from "Recollections of a Tour in Scotland, A.D. 1803" by Dorothy Wordsworth.